Following on from our post last friday, Bloghorn noticed Blue Peter, the Beeb’s long running children’s TV show, has launched something called Comic creator, which you can find here. 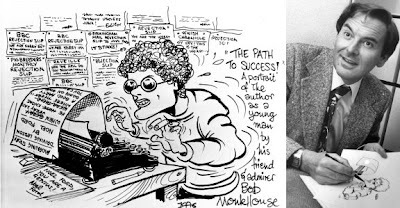 We’ve seen acres of coverage for the launch of new kids’ comic The DFC (left), the 70th anniversary of The Beano and Phill Jupitus’s comic strip programme on Radio Four. There has even been a graphic novel serialised in The Times. I agree with Neil Dishington, who wrote on this blog yesterday that the Phill Jupitus thing was nothing special, but is that because we’re cartoonists and therefore he’s preaching to the converted? I think it’s likely that many listeners would have found Jupitus’s sincere enthusiasm about comic strips quite infectious. 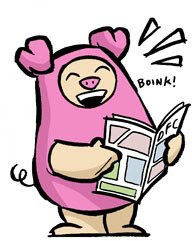 But they misrepresent cartooning, some cartoonists cry, it’s obvious they don’t know what they’re talking about. Well, maybe. I’m sure I heard James Naughtie talking about “animators” at The Beano on the Today show on Monday, but is there a single profession that doesn’t think it is often misrepresented by the media? I know journalists who think the media misrepresents them. And as for the grumbling over celebs such as Jupitus drawing cartoons, cartooning has always been something where everyone wants to have a go. That’s because it’s fun. We often encourage that attitude, at events such as The Big Draw and the Shrewsbury Cartoon Festival. 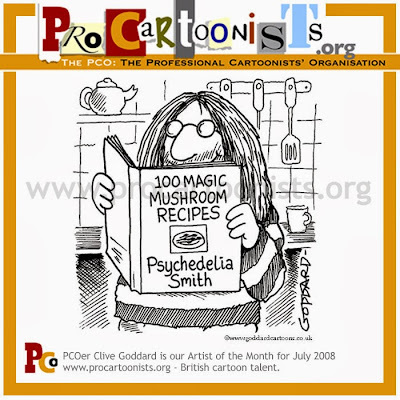 Clive Goddard has been the PCO Artist of the month for July 2008. If you’d like to see the four featured pieces of Clive’s work we have published on Bloghorn during July, click the term, Clive Goddard, in the labels underneath this writing, or, click G for Goddard here. Apparently Phill Jupitus is a thwarted cartoonist. I should admit that he is not my favourite comedian, and I am not a particular fan of comic strips, as opposed to stand-alone cartoon jokes. Much of what Jupitus had to say in his Radio 4 show seemed like a repeat of what most cartoonists talk about when they get together: lack of markets and indifferent editors. The interviewees in the show were able to speak from strength – Garry Trudeau (Doonesbury), Steve Bell (If), Peattie and Taylor (Alex). But I always think that artists like this have become part of the establishment they lampoon. Is it just as easy to get stuck into royalty, celebs and the City of London when you are selling strips in umpteen countries around the world and your stuff is syndicated all over the place? I do think Steve Bell has kept his integrity, but I wonder how much attention people pay to “cartoonists with attitude”? We, as a nation, do seem happy to accept bland publishable stuff as the norm. 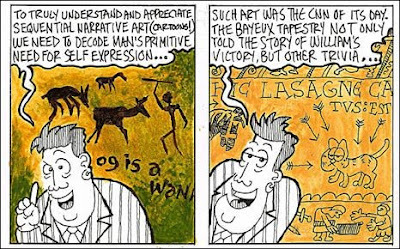 I did like some of the comments by the cartoonists interviewed by Jupitus, such as Steve Bell’s call for a “missionary zeal” in making cartoons which have something to say. In contrast, I was not so keen to hear that the future of cartoons will be online. Overall, I found the programme bland, smug and much of it decidedly familiar. A real time-filler. It was lazy broadcasting and lazy journalism. And lo and behold, in the Guardian newspaper of July 22, an article by Jupitus retelling the same stuff as the programme, accompanied by a cartoon strip drawn by … celebrity cartoonist Phill Jupitus. Thanks for the review Neil. Bloghorn says click D for Dishington. The BBCs Listen again facility is here – and the program will be online until Saturday 26th July. The Graphic Art of Comment, an exhibition of cartoons and illustrations from the Comment pages of the Guardian newspaper opens tomorrow (July 24) and runs until September 26. It showcases the work of more than 20 artists whose work can be seen in the paper’s Comment pages, including Martin Rowson, Steve Bell and David Parkins. The exhibition is at the Newsroom Archive and Visitor Centre, 60 Farringdon Road, London. (Tel:020-7886 9898). Opening times: Monday to Friday 10am-5pm; Saturday 12pm-4pm; Closed August Bank Holiday weekend. Admission is free and there is a free catalogue (while stocks last). Multi-award winning animator and cartoonist Nick Park of Aardman Animations is interviewed here by Owen Gibson of The Guardian. 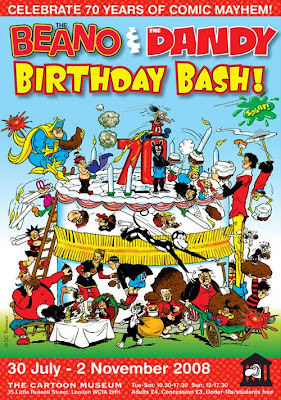 Park talks with pleasure of getting to edit the 70th anniversary edition of the Beano which we blogged about earlier here. 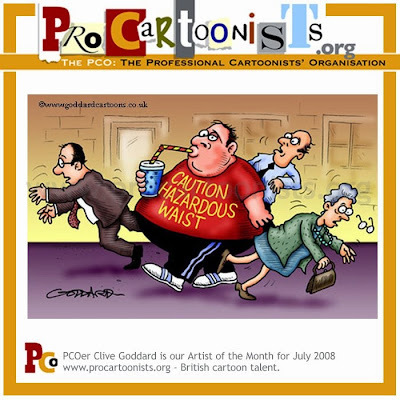 Clive Goddard is the PCO Artist of the month for July 2008. Bloghorn says click G for Goddard. Comedian Phill Jupitus hosts a programme called Comic Love on BBC Radio Four this week, in which he talks about his love of comics and newspaper strips. An occasional cartoonist himself, he has produced a strip to go with an article promoting the radio show in the BBC’s online Magazine. You can see it here: Seeing the world in four panels. A different strip and article can also be seen in the July 19 edition of Radio Times.